Traditionally, Jesters, the historical entertainers for kings and queens are represented as fools and idiots. But on popular games, Joker Jester, you will realise that he is more than meets the eye. The Joker Jester is known to be as clever and rewarding as he can be when players watch the reels spin, and see all of the WILDS that appear on their screen that amplifies all of the gold they've placed as their bets. The entertainment that he provides for you comes in the search of letters, numbers, musical instruments, and treasures that he would set at your feet. 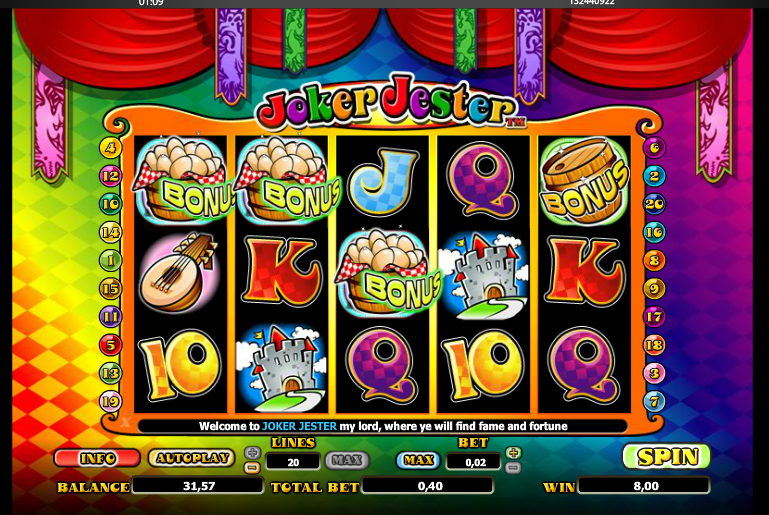 Where most higher-ups will discard their jesters whenever they fail to please them, the Joker Jester online games will become a necessity in your life when you want to make big winnings! If you need to keep a list of all of the online casino game developers, so you know that whenever you next play one of their games you know that it's one that you can place your trust on, Nextgen would be one that you should keep right at the top. Right from the beginning, the developers behind the name know how to attract new players to try their games, and keep existing players continue to access them again and again. 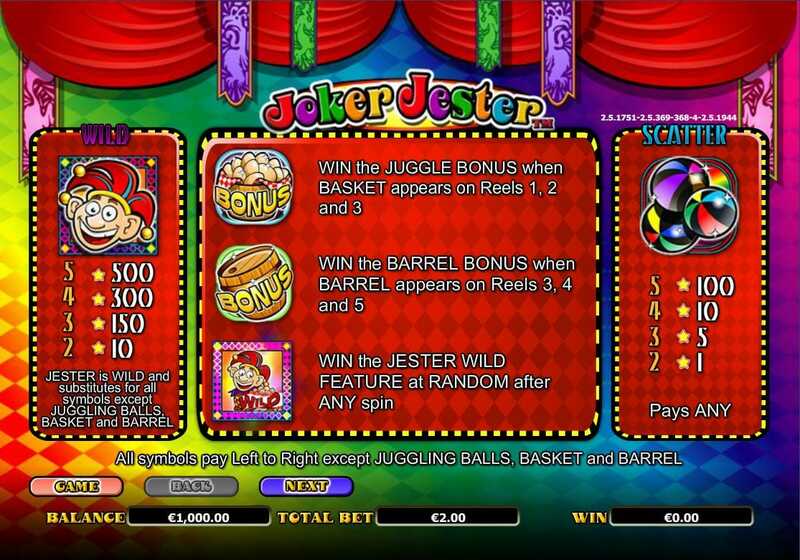 After gaining a high reputation from some of their other successful games like Golden Mane, Renegades, and Thai Sunrise, Joker Jester is a particular slot game that you will end up bookmarking on your browser! If you love promo's, get the best slot machine bonuses now. If there's something that you should know about the Joker Jester, it would be that he likes to perform in riddles. You will find that there a many letters and numbers that spin on your screen, and it's your task to answer the riddles and find as many matching symbols as you could. Furthermore, the Joker Jester is not a real entertainer without his musical instruments. Finding 5 of his instruments on the reels multiplies your stake by 250, and finding 5 of the castle symbols multiplies your stakes by 400. But those symbols aren't the only riddles that he likes to present to you on screen, as there are many WILDS and SCATTERS that guide you to many BONUS rounds. Joker WILDS: When spotted on your reels, the player gets paid up to 500 times their original stakes. Jester Jumper WILD: when the Jester bounces on the eels, they boost your winnings and substitutes other symbols for more Joker WILDS. Joke SCATTERS: When spotted on your reels, the player gets paid up to 100 times their original stakes, plus it takes you across to the Juggle BONUS round. Juggle BONUS round: triggered by 3 baskets on the reels where the player will juggle the eggs for prizes, and the more eggs they juggle, the more prizes they win. Barrel BONUS round: when 3 barrels appear on your reel, you'll be awarded more prizes when picking 1. There really is no other Jester like the Joker Jester, which makes it impossible for you to discard him from your royal presence! You never know what to expect when a Jester appears in front of your screens. They may play a lousy ukulele song, or fail to do a juggling act. But when it comes to the Joker Jester, nothing he does is lousy, and there's nothing that he could fail at, even providing players with the best winnings that the slot game has to offer. You have to give Nextgen a lot of credit for taking a simple theme and amplifying it with riddling WILDS, surprising SCATTERS, and outstanding BONUS FEATURES.